This last Friday was one of those days where truth is stranger than fiction, one of those days where events arise and collide in ways that make you believe in irony, fate, destiny and the urgent need to celebrate every moment of this precious lifetime. Before I tell you what happened, I need to tell you about the weather and the state of the ice on Great Slave Lake, as it places a big part in the events of the day. (I’ve vowed to stop blogging about the weather , but it seems its part of everything that happens up here.) It turns out we moved to Yellowknife just in time for one of the longest winters ever. It only ended last week. Last week was the first week in which we’ve had any consistent temperatures above zero, and if you can believe it, it is raining today. (Or as the neighbour says, melted snow is falling from the sky). We’ve calculated, rather unwisely, that its been 8 months since we’ve had much of either – rain or above zero temperatures. So you can imagine how giddy with excitement we’ve been. Changing temperatures mean changing ice as well. All the snow finally all melted, and the day after my last blog post, the ice lifted and dried up. No more wet puddles. Instead of snow everywhere we looked out on wind polished bare black and blue ice. For a short while. It quickly changed back to white again – not because of frost on top, which is how it looks, but because of structural changes beneath the surface. 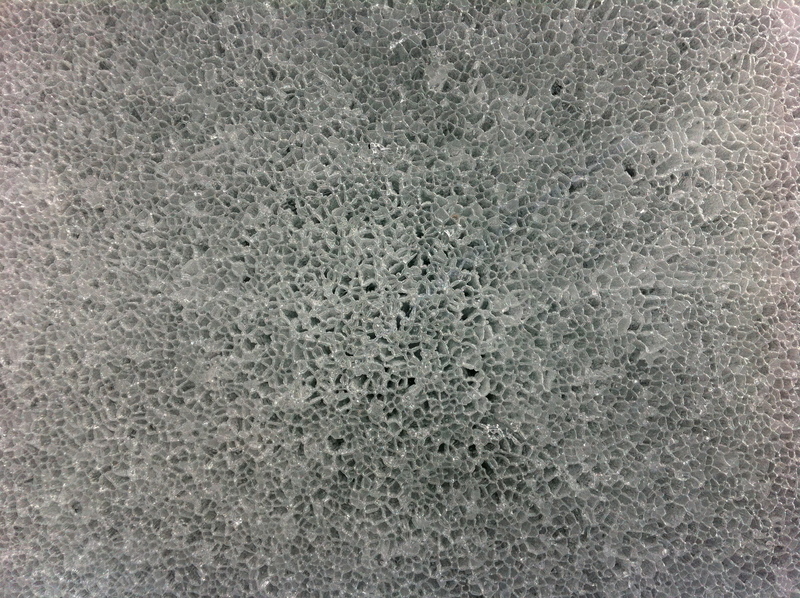 Fascinating patterns appeared everywhere, evidence of the changes going on throughout the ice layer. This is candling ice, little clear bundles of ice packed together. If we needed more evidence of the ice changing, a jeep fell through the ice last week. It was only a matter of time really. Some guy was out joy riding and tearing around the lake trying out his new jeep. He went too near the shore, in the soft area near the ice road, an area where even a newcomer like me would know not to drive, and fell through the lake into about 2 feet of water. He lost his transmission in the process and had to be towed out. It was quite the topic of news and head shaking about town last week, primarily I think because it was an entirely avoidable affair. So, Friday. Well, it started out with the promise of great fun. Nearby houseboat neighbours decided to host a swimming party. To prepare, they spent a day with a chainsaw and created a pool sized opening in the three feet thick ice beside their house. The shards of ice that were cut then became ice seats around the pool – seats fit for a king. The whole area looked like amazing sculpture. I wasn’t tempted by the great scenery to have a dip that morning, but it was quite a bit of fun nonetheless, and there were a few folks crazy enough to take a quick dip ( before their hearts stopped!) Luckily it was a warmish and sunny day. We finished off our day there too. We went back at sunset and sat beside the water, warmed by a blazing log fire, set right on the ice, and watched the day’s end with a spectacular red sunset. On our way over to the swimming hole we met a neighbour who was off to rescue his snowmobile, which had fallen through the lake ice the day before, in a soft spot. He had stopped to look at something on a nearby island, and without warning the sled just dropped right into the lake. Apparently it was only in 2 or 3 feet of water, but its a scary thought. This man has lived here for years, and knows something about the ice, and the lake. Later that afternoon Martin and I went out in the spectacular sunshine for a skate ski on the ice road. 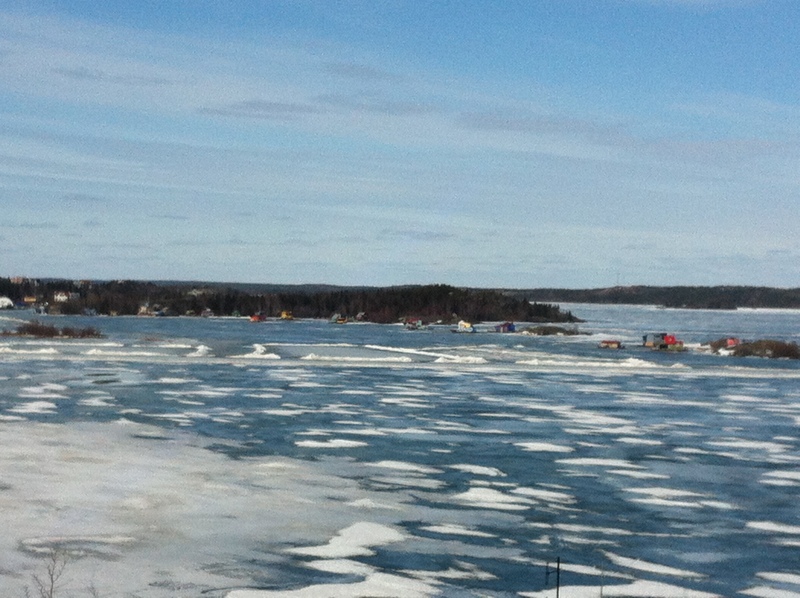 (Which is still solid and safe, and as of the weekend, still getting fishermen in trucks running up and down it. The government access point to the road is closed and there are stiff penalties if you illegally use it. But you can still get on the road legally and safely in other areas, although of course the government does not suggest one do so). Little did we know that as we were out there a great drama was unfolding nearby. My first clue was that as we were returning to town, I noticed that a kite skier who was nearby was nowhere to be seen. It seemed funny that he had disappeared so fast, but I merely assumed he’d turned around when I wasn’t looking. However by the time we got to the end of the ice road, it became apparent that something was seriously wrong. There was a large crowd of watchers on the shore, an ambulance and a bunch of search and rescue folks heading out onto the ice. There were also a couple of people further out on the ice, and although we couldn’t see it well, this is where the drama unfolded. It turns out one of the local dog mushers was out with his team on the lake (in fact Martin saw him set off) and fell through the ice in a soft spot. Apparently this area of the lake is known to have soft ice in the spring, as there is a reef just underwater, but there was no visible indication of softening there yet. The whole team and the musher fell through the ice. Apparently the fellow had a great deal of difficulty getting out, and thought he was a goner. A little girl riding her bike on the ice road happened to hear him calling (there was quite a wind, which carried the sound a long ways) and was able to get help. The kiter had stopped to help out. At the end of the day the musher was fine, although terribly shaken, but heartbreakingly, two of his dogs died in the accident. Most of the dogs managed to get out of the water onto a nearby rock, but for some reason a couple of the dogs in the middle of the team could not. I think it’s amazing that any of them survived, when you think that they are all tied together and attached to a wooden sled. 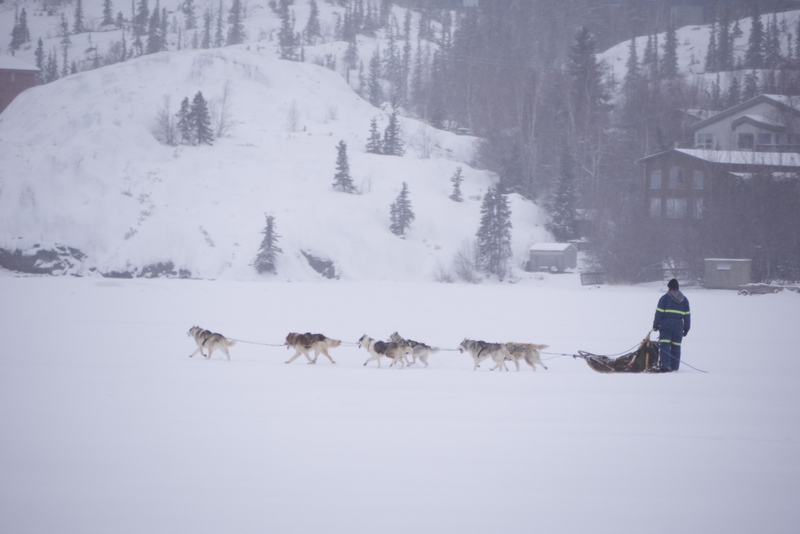 We see this local musher going out often, and its one of the great pleasures of living on the lake, and in the north, to look out and see a him and his team going by. I haven’t met him yet, but most of my friends and neighbours know him. I am horrified to think of his experience, and how he must be feeling over the lose of two of his dear companions. I offer my deep thanks to the spirit of the lake and the land for his survival, and send a white light of love and prayer for the souls of his dogs. May they be joyfully running even now over the snowy trails in husky dog heaven. This entry was posted in Loves and Losses, North of 60 and tagged death, Great Slave Lake, sled dogs, Yellowknife, Yellowknife Bay. Bookmark the permalink. This gave me cold shivers. I knew about the incident as we have been following YK news for some time (we are moving up there in July). Such a sad sad thing to happen. Very sad, indeed. May everyone else get through break-up safely! Reblogged this on The MediaMentor's WordPress Blog. 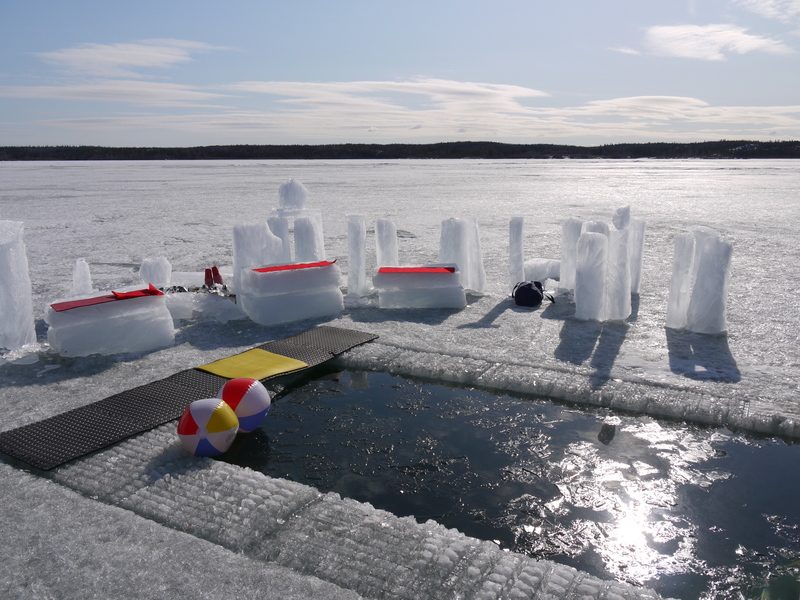 The hole in the ice was actually for a Canadian TV show that will be broadcast during the second week of August. Hello from Berkeley. I just wanted to say that I read your whole blog in a fit of insomnia. Please keep updating! I will never complain about the weather when camping again. Thanks for the perspective.